I became a victim of an overabundance of zucchini. I also became a victim (or hero) of my baking science geekiness and picked up “Naturally Sweet” by America’s Test Kitchen. The cookbook analyzed familiar recipes and devised ways to make them with less sugar. One recipe in the book required baking with zucchini so I jumped at a chance to try it. For high altitude I added more flour and less baking powder. I opted for applesauce as my vegan egg substitute because it would add in some moisture needed at high altitude. For a flavor boost I swapped the spices with ginger and the nuts with chocolate chips. 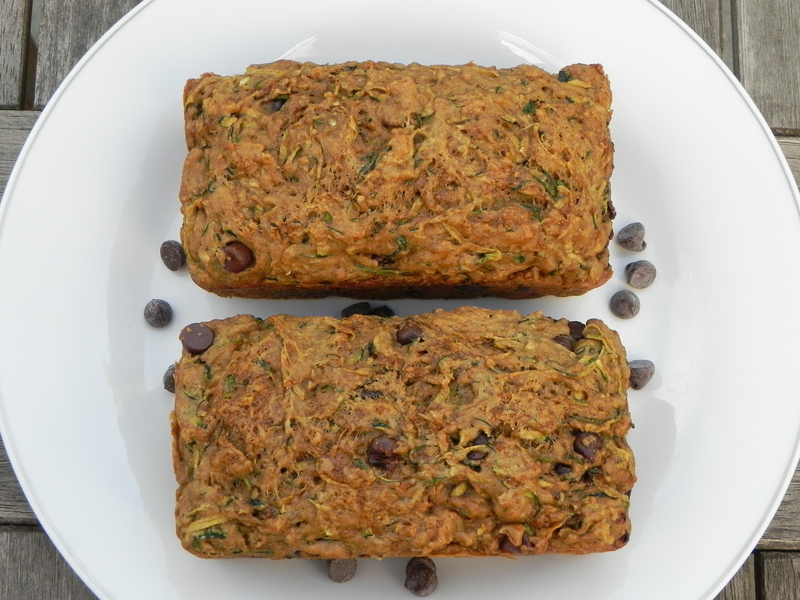 The bread is loaded with zucchini but also low in sugar, so it’s good for you. Right? Adjust oven rack to middle position and heat oven to 350F. Grease a four-cavity mini loaf pan. Place zucchini in center of a dish towel. Gather ends together and twist tightly to drain as much liquid as possible. Discard liquid. In a medium bowl, whisk 3/4 cups sugar, oil, applesauce, and vanilla together. Stir in zucchini until combined. In a large bowl, whisk both flours, ginger, baking powder, baking soda, and salt together. Using rubber spatula, stir in zucchini mixture until combined. Fold in chocolate chips. Scrape batter evenly into cavities of prepared pan, smooth tops, and sprinkle with remaining sugar. Bake until toothpick inserted in center of a loaf comes out with a few moist crumbs attached, 28-32 minutes. Let loaves cool in pan for 30 minutes, then transfer to wire rack to cool 30 minutes more. Rose is my all-time favorite scent. Walking in to a rose garden puts a relaxed smile on my face that lasts for hours. When I saw a cookie recipe that included (gasp!) rosewater, I knew I had to try it. The recipe also included cardamom, another fave of mine, so it had to be good. The cookies were already vegan and didn’t need adaptation for high altitude, so I had that covered. 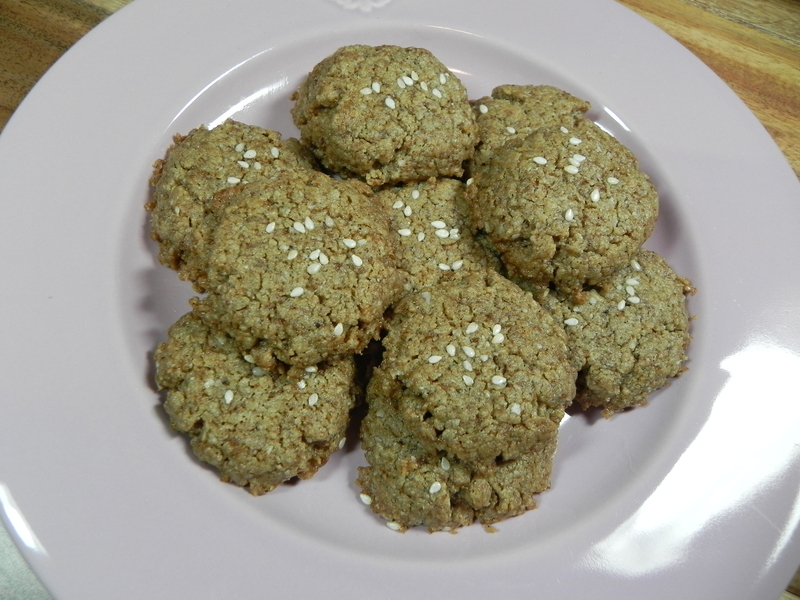 I did add ginger to give them some zing, and decorated them with sesame seeds for looks and texture. They have a low-glycemic sugar, healthy fats, and lots of calcium making them good for you. So go ahead, have another. Preheat oven to 350F. Line a baking sheet with parchment paper. Place coconut sugar, almond flour, cardamom powder, and ginger powder in a bowl and whisk. Add tahini and rosewater and mix well. Form batter into walnut-sized balls. Place cookie balls on prepared baking sheet. Gently press down until they form thick discs. Sprinkle with sesame seeds. Bake for 10-11 minutes, or until slightly brown. Wait until cooled to remove from the baking sheet. Makes 16-18 cookies. Wandering through the market I came across Silk’s new Caramel Almond Creamer. Drooling, I brought it to the checkout, all the while wondering what I would do with it. Until recently, caramel has been an unavailable flavor for vegan cooks unless it involved coconut milk. Seeing that I am not a fan of coconut, I have been deprived of that luscious caramel flavor. Until now. Because I was looking for a no-bake idea, I thought that truffles would be a wonderful base for caramel. The recipe that I found had a completely different taste profile but would adapt well to the creamer. It didn’t have added sugar which wasn’t necessary with the already sweetened Caramel Creamer. 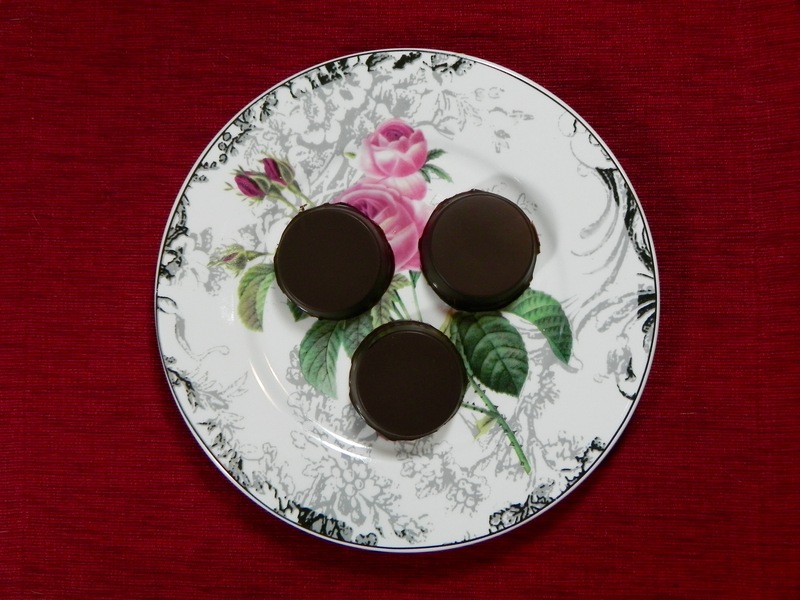 The truffles still turned out quite sweet, so I tamed them a bit by rolling them in raw cacao powder instead of the author’s ideas of melted chocolate and raspberry. This recipe requires a high speed blender to work the ingredients together. The blenders are very useful but can be a pain to clean when making something sticky like truffles. But I’ve got you covered. When you’ve scraped up all of the truffle bits that you can from the blender, add milk to the dregs and re-blend. It cleans up the mess while making a decadent chocolate milk. Line a baking pan with wax paper. In a high speed blender, blend cashews to a fine crumble. Add salt, dates, creamer, coconut oil and cacao powder, blending to combine. Using your hands, roll the mixture into balls and place on lined baking pan. Alternately, spread fudge mixture into the pan and cut into squares when it has hardened. Transfer pan to fridge to set truffles, at least 30 minutes. Place some cacao powder in a shallow bowl. 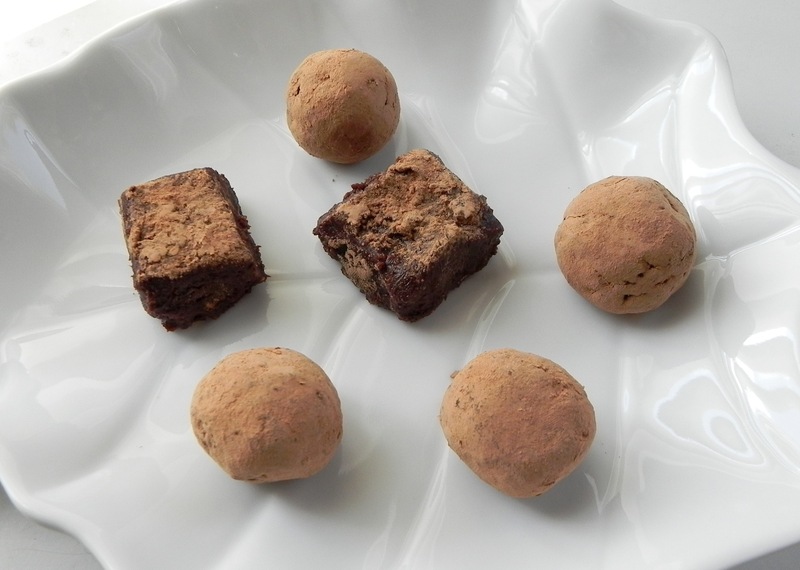 Roll truffles in cacao powder to cover, or sprinkle on squares. Store in refrigerator.